Improving the current crowdsourcing platforms, using Ethereum we can introduce new ways of funding which will allow projects to be funded in a transparent and decentralized way. 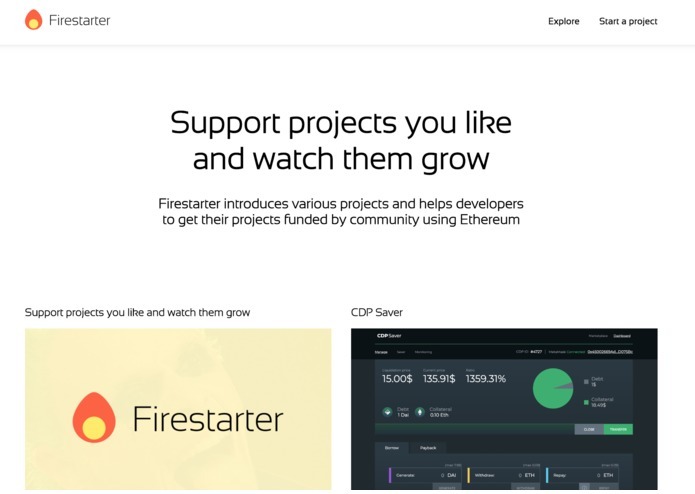 Firestarter is a hybrid platform for community-based projects that leverages the power of Ethereum. Project owners can start a new project by describing their project and their goals, login/register is done through metamask and no sign up is required. Compound Investing - Send Dai tokens which will be locked in Compound, the interest earned from that money will go to the project owners, users can withdraw the same amount they put in at any time. In order to give investors more control over the project they invested in, we integrated DaoStack, where users who invest money get reputation in the system. Users vote with that reputation on feature proposal which they can accept/reject. Sleep is overrated and salmon sandwiches are great. Besides that, we had a fun time learning more about DaoStack, and yes, we built a DAO. Compound also provides an easy to use interface which enables the user to start earning interest right away, which is one of the key features. BUIDL some more, and use our own platform to fund further development. I've made a design and worked on intergrating the frontend. Worked on Solidity code and on some parts of backend code. I worked on building the frontend architecture as well as integrating the frontend with the blockchain.